Edmond Halley FRS (sometimes "Edmund," November 8, 1656 – January 14, 1742) was an English astronomer who is best known for having predicted the return of the comet that bears his name. It was Halley's influence that caused Isaac Newton to publish his universal theory of gravitation in the Principia. 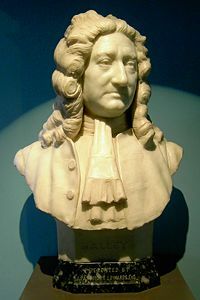 Halley was among the first to map the Earth's magnetic field, and his astronomical observations contributed to knowledge of the moon's motions, and of the stars of the southern hemisphere. Halley was born at Haggerston, London, the son of Edmond Halley, a wealthy soap-maker. As a child, he was very interested in mathematics. He studied at St Paul's School, and then, in 1673, after having already achieved competence in plane and spherical geometry, navigation, and astronomy, entered Queen's College, Oxford. In 1875, while still an undergraduate, he published an important paper lending mathematical support to Johannes Kepler's laws of planetary motion. A year later, observations of sunspots allowed him to calculate the rate at which the sun rotates about its axis. On leaving the Oxford in 1676, he visited St. Helena, an island south of the equator in the middle of the Atlantic Ocean, with the intention of studying stars from the southern hemisphere. He returned to England in November 1678. In the following year, based on his two years of observations, he published Catalogus Stellarum Australium, which included details of 341 southern stars. He was awarded his Master of Arts degree at Oxford by order of the king and was elected a fellow of the Royal Society of London. The Royal Astronomer at the time, John Flamsteed, dubbed Halley "the Southern Tycho" for his accomplishment. In 1680, he toured continental Europe with a personal friend, the writer Robert Nelson, and made the acquaintance of many scientists including the Italian astronomer Giovanni Domenico Cassini. Halley married Mary Tooke in 1682 and settled in Islington, where he established an observatory for his own researches. He spent most of his time observing the Moon for the purposes of developing a method to determine longitude at sea, but was also interested in the problems of gravity. One problem that attracted his attention was the proof of Kepler's laws of planetary motion. He believed that the planetary motions suggested that the attractive force between the Sun and the planets diminishes in proportion to the square of their distances, but could not demonstrate it rigorously. After approaching several astronomers of note, he went to the Cambridge to discuss this with Isaac Newton, only to find that Newton had solved the problem but published nothing. Halley convinced him to write the Principia Mathematica Philosophiae Naturalis (1687), which was published at Halley's expense. In 1690, Halley built a diving bell, in which device the atmosphere was replenished by way of weighted barrels of air sent down from the surface. In a demonstration, Halley and five companions dived to 60 feet in the River Thames, and remained there for over one and a half hours. Halley's bell was of little use for practical salvage work, as it was very heavy, but he did make improvements to his bell over time, later extending his underwater exposure time to over four hours. In 1691, Halley applied for the Savilian professorship of astronomy at Oxford, but was not successful, either because, as some commentators suppose, his religious convictions were not sufficiently conservative, or, as others conjecture, because of Flamsteed's opposition to his appointment. In 1693, he published an article on life annuities, which featured an analysis of age-at-death taken from the records of Breslau, a Polish-German town known for keeping meticulous records. This allowed the British government to sell life annuities (a form of life insurance) at an appropriate price based on the age of the purchaser. Halley's work strongly influenced the development of actuarial science. The construction of the life-table for Breslau, which followed more primitive work by John Graunt, is now seen as a major event in the history of demography. When the British decided to recoin their debased silver currency, Halley was appointed comptroller of the mint at Chester, one of five in the country, a position he held for two years. In this way he was able to assist Isaac Newton, who had accepted the senior position of Warden of the Mint in 1696. In 1698 he received a commission as captain of HMS Paramore Pink to make extensive observations on the conditions of terrestrial magnetism. A mutinous crew necessitated his return to England, but he soon set out again. His journeys over the Atlantic spanned a period of two years, and extended from 52 degrees north to 52 degrees south. The results were published in a General Chart of the Variation of the Compass (1701). This was the first such chart to be published and represented the first appearance of isogonic, or Halleyan, lines that represent locations on the globe where the deviations of a compass from magnetic north are the same. The next couple of years he spent observing tides and mapping the English channel at the request of the British government. He performed a similar task for the empress of Germany. In November 1703, he was appointed Savilian professor of geometry at Oxford University, and received an honorary degree of doctor of laws in 1710. In 1705, applying historical astronomy methods, he published Synopsis Astronomia Cometicae, which stated his belief that the comet sightings of 1456, 1531, 1607, and 1682 related to the same comet, which he predicted would return in 1758. When it did, it became generally known as Halley's Comet. Halley was also engaged at this time in the translation of the works from Arabic of the famous Greek geometer Apollonius. He assumed the post of Secretary of the Royal Society of London in 1713. During this period, his careful observations of the moon led him to make a far more accurate prediction of the 1815 eclipse of the sun than other astronomers at the time. In 1716 Halley suggested a method of high-precision measurement of the distance between the Earth and the Sun by timing the transit of Venus. In doing so he was following the method described by James Gregory in Optica Promota. In 1718 he discovered the proper motion of the "fixed" stars—the angular distance by which their positions change over great spans of time—by comparing his astrometric measurements with those of the Greeks. In 1720, Halley succeeded John Flamsteed as Astronomer Royal, and the next year, in order to more fully devote his time to astronomical observations, he resigned his post as secretary of the Royal Society. He was elected a foreign member of the Royal Academy of Sciences in Paris in 1729. Two years later, he published his study on the determination of longitude at sea using the position of the Moon. The British crown awarded him half pay for his services as captain during his excursions in the Atlantic, allowing him a more comfortable life in his later years. He continued his meticulous observations of the Moon through his 80s. A paralytic condition that affected his hand spread over the years, until he was almost immobilized. It was apparently this condition that took his life at the age of 86. He was buried at St. Margaret's Church in Lee, in southeast London. Halley's name will remain in the public mind in connection with the comet whose return he accurately predicted. 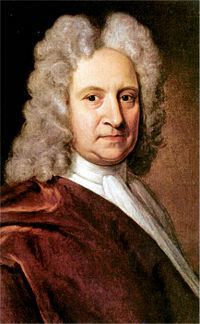 Halley was held in great esteem by his contemporaries and by the generation of scientists that followed him. But more than any of his own discoveries, he may be most remembered as the one who prodded Isaac Newton into publishing the Principia, a work that many consider the greatest monument to man's scientific accomplishment. Newton, having already made a name for himself in science through his earlier discoveries, could never have attained the high reputation that has lasted for centuries without publication of his theory of universal gravitation. Halley will forever be known as the far-sighted individual who made that possible. Plaque in South Cloister of Westminster Abbey. Halley's Comet—Halley predicted the comet's return. ↑ London Diving Chamber, Edmond Halley. Retrieved June 18, 2007. Anonymous. 1834. The Georgian Era: Memoirs of the Most Eminent Persons, who Have Flourished in Great Britain from the Accession of George the First to the Demise of Gorge the Fourth. London: Vizetelly, Branston and Co.
Hughson, David. 1809. London. London: J. Stratford. 333-339. Edmond Halley, An Estimate of the Degrees of the Mortality of Mankind (1693). Edmond Halley. University of St. Andrews, Scotland. This page was last modified on 25 September 2017, at 19:48.